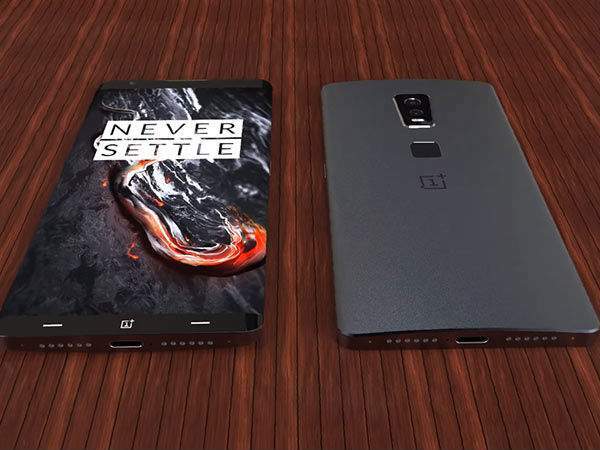 OnePlus 5 Specification, Price, Release Date, Features, Rumors, Images, News & Updates: Among all the hype surrounding Samsung’s new Galaxy S8 smartphone, almost everyone missed this interesting news about the recent entrant into the smartphone world, that too with a bang. Yes!! We are talking about Chinese company OnePlus’s upcoming phone OnePlus 5. 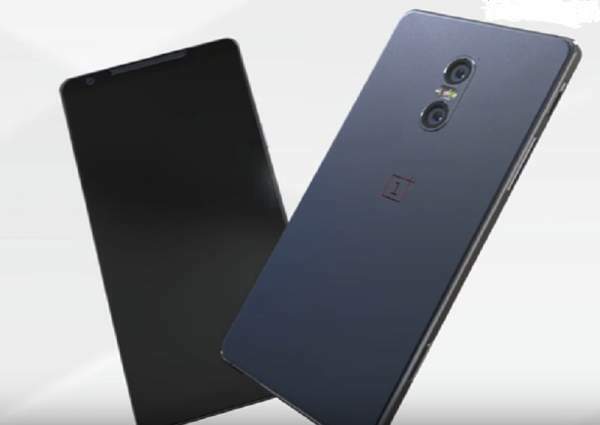 If reports are to be believed, the brand boasting of BigB as its brand ambassador, OnePlus will soon be releasing its next generation One Plus 5 which is said to be inspired from OnePlus3T which is one of the best smartphones right now on the shelf Google Pixel XL, Google Pixel, and Samsung Galaxy S8. So, here is all you need to know about this new wonder. 2 OnePlus 4 or One Plus 5? OnePlus 4 or One Plus 5? Where did the OnePlus 4 go? The plausible explanation is that the company owners are in tandem with the Chinese superstitious belief that the number ‘4’ is unlucky. 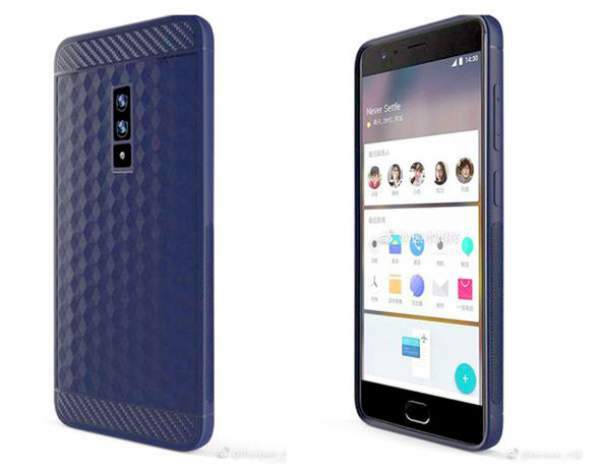 So, one can say that the latest offering OnePlus3T was supposed to be the OnePlus4. Isn’t it a nice irony- the makers of latest technology being superstitious!! Check: Huawei P11 Release Date. What will OnePlus 5 look like? Talks in the town indicate an all-glass or ceramic chassis design in a full matte color called ‘black as midnight’. The makers seem to be hooked on its predecessor’s hit concept of Colette edition implying that it could get a premium look. It features a 5.5-inch dual-curved edge AMOLED FHD/2K display. And to top it all, it is said to be equipped with a high capacity RAM of up to 6/8GB paired with a 64/128GB expandable internal storage along with an eye-catching camera of 25 MP rear and 16 MP front, according to TheChristianPost. 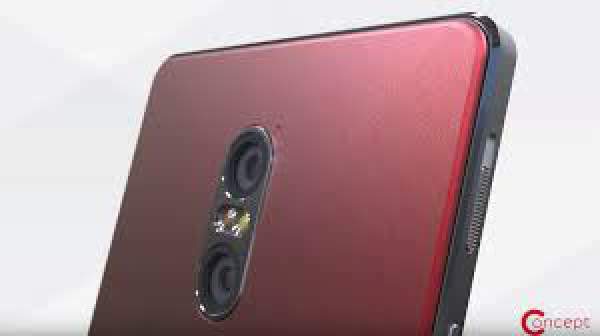 The reports also suggest that it might come with a dual rear camera setup giving its users the unprecedented experience of recording in 3D. And not to forget, the Android smartphone will feature the powerful Qualcomm Snapdragon 835 processor, houses a beastly power pack of 4000mAh battery. 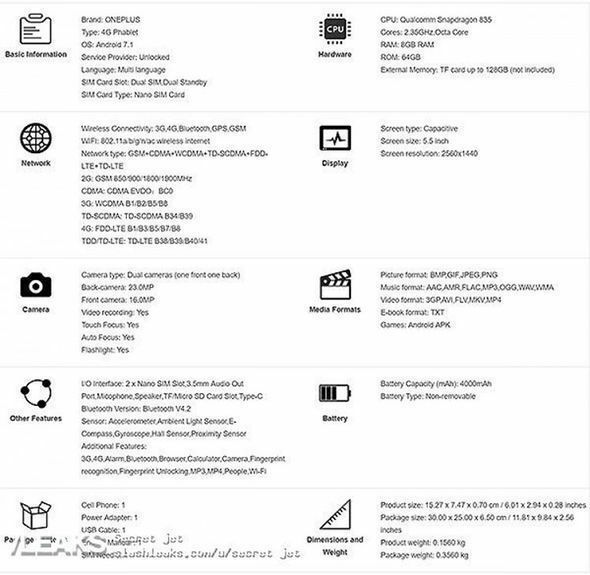 On the connectivity front, it will have a USB Type-C connector and Qualcomm Quick Charge feature enabled. And what makes the day is the fact that it’s all with the latest Android 7.1 Nougat operating system. Also, it is supposed to be powered by Qualcomm’s latest processor, which also is the lifeline of the recently announced Samsung flagships – Galaxy S8 and S8+ – the Snapdragon 835 SoC, according to Gizmochina. While on the other hand, Xiaomi Mi 6 is also expected to come with the latest processor. Check: Windows 10 Creators Update Download. Update 3 (May 29): OnePlus has launched a referral program via which the customers can save money on all types of One-Plus products. If you have purchased anything directly from OnePlus.net, the referral link will get activated and you will get $20 (or equivalent off in the local currency) from the next purchase. Update 2: Express.Co.Uk said that the Alert Slider seems to have been ditched. It is used to quickly toggle between Silent, Priority and All Notifications. 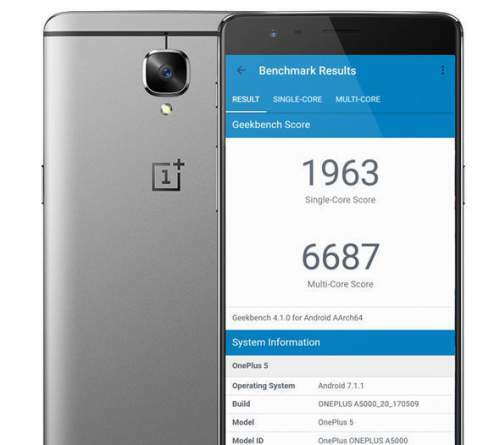 The alleged Geekbench benchmark test showed the OnePlus 5 outperforming the Samsung Galaxy S8. Update 1: One Plus 5 tests results show that Flagship Killer Is Better Than Google Pixel and Samsung Galaxy S8 in terms of speed. For instance, the OnePlus 5 averaged 20 seconds for “Modern Combat 5” while the Galaxy S8 took 23 seconds. The Google Pixel XL took longer at 27 seconds. How costly can it get? OnePlus 5 is expected to make its appearance on online shopping portals by April-June 2017. The 64 GB version is predicted to cost around US$439, making it around ₹30, 000 for the Indian markets while the 128 GB model won’t go lower than US$479, getting an approx. the figure of around ₹32,000. It may come with a 256gigs of internal storage too. MySmartPrice has listed the 8gb RAM & 128gb internal memory version at Rs. 34,999 ($530+ approx.) with a possible launch date of June 30, 2017. Check: Project Scorpio Release Date. While the news seems to be making eddies in the pool of smartphone market, stay tuned to TheReporterTimes.com for more Technology updates! Share with us, what do you want to see in the upcoming ‘beast’ smartphone? Feel free to comment below.